There are many landscape photography locations around the world that have achieved iconic status. Locations that because of their uniqueness or particular beauty, attract obsessed photographers like myself to them in droves. They have become places that you go to put a notch on your tripod or a tick on your bucket list. I've been to a few of these locations (Deadvlei in Namibia and Glacier Lake in Canada are two examples) and the experience has usually prompted a mix of emotions. Joy at being in such a place and frustration at the challenge of finding a shot that hasn't already been done a thousand times before. 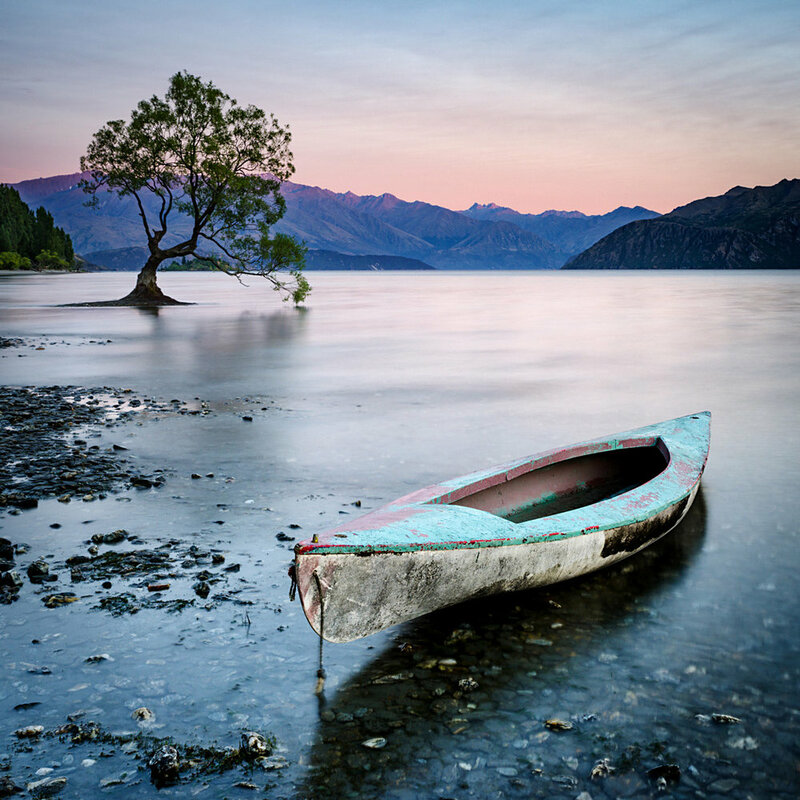 That Wanaka Tree, in Wanaka New Zealand is one such iconic location. On my recent 3 week family holiday to the south and north islands of New Zealand I finally got a chance to see and shoot this beautiful tree. It is a unique scene to see. A single isolated tree growing in the shallows of a picturesque lake, ringed by mountains. Apparently the tree sprouted from a fence post in a long since vanished fence and it is now one of Wanaka's signature draw cards. I don't think any of the images I got were as good as the best I have seen of this location and I was certainly disappointed at the conditions I got but you take what you can get on a limited and pre-planned visit. I paid morning and evening visits on several occasions and jostled for space with the other photographers and tripods. Mornings were less busy but regardless there were very few options for framing and composition. One evening some inebriated locals canoed up to us and exchanged a few ribald pleasantries with the tourists. Disturbingly one of them climbed up into the tree and I had visions of a branch breaking before my eyes and the lynch mob that would soon be assembling to reak vengeance on such stupidity. Fortunately nothing happened and they soon left. The small bonus was they left the canoe behind and this presented the only unique opportunity for a different composition that I had. After shooting two mornings and two evenings and using a variety of focal lengths I feel like I did the best I could with the conditions I had. In a perfect world other times of the year and better skies would get me better shots. My recommendation to other photographers would be to try and visit at times other than peak tourist seasons as Wanaka itself was packed to the gunwales with tourists. I visited during the summer holidays and there were a large number of photographers (of both the enthusiast and smartphone variety) at the tree at all times. Autumn would provide some warm fall colours to the backdrop and winter would provide interesting conditions too though probably a higher water level. Wanaka also has other photography opportunities nearby including Roys Peak (which I also visited) and other mountain locations. An extended stay in the area could be be really productive. Regardless of how often these sorts of locations have been photographed, I still think it is worth visiting them for the experience and the satisaction of having your own versions of the iconic shot right there on your hard drive.